Clara Polito’s a baking phenom who recently moved to New York from her native LA. She had us over for pancakes and shared her thoughts on the virtues of being vegan and cooking your truth. You can find her cookbook here and follow her on Instagram here. I started baking when I was 12 because I went vegan and I couldn’t find any vegan sweets around town. It kind of forced me to make baking my hobby and I discovered that I really loved baking. It was around the time that I was also really getting into music and bands around LA, so I would set up shop at different shows when I was in middle school and up until around mid high school. People got to know my pastries through that and then I got clients and sold to different stores and a lot of events. When all of this was starting, it was sort of a pre-teen, self-discovery, phase. I was just becoming more politically aware and being vegan really opened my eyes to different corporations I didn’t agree with. A couple different venues and promoters would invite me to sell at different shows so I would pick the ones that I wanted to go to and would sell that way. I was able to get a feel for business and baking while also being able to see a band I really wanted to see. Ultimately, being vegan is the way that I’ll always want to live my life. The transition to becoming vegan involved becoming aware of what it took for something to be made through animal labor, human labor, who’s making it, who’s profiting... I think having that instilled in me from a young age has made me really aware of the food that you support and that you put in your body. I like how open cooking is. I can just throw out a couple flavor combinations I’d want and then just kind of work it out. It’s such a functional art. You make it and eat it, other people can enjoy it, but it’s not something that requires an incredible amount of patience. I’m a self-taught cook. My approach is reading a recipe or looking at other people’s non-vegan recipes and then when I cook it, I put it into words that I understand. I make cooking work for me and the skill sets that I have, as opposed to trying to force myself into cooking techniques that are just really not enjoyable. I look up to Brooks Headley. I like that he comes from a fancy cooking and pastry background, but he’s making food that everybody enjoys and isn’t pricing out people who want to eat healthy. I really love Mina Stone’s work. I think that her cookbook “Cooking for Artists” is really beautiful. I love the mixture of recipes and the photos in it are really cool--they’re not super orchestrated, it’s all very fun yet elegant. Dorie Greenspan is definitely someone I look up to for pastries. She’s written a bunch of different dessert cookbooks. I started out with dessert, and she was one of the initial chefs who I admired. 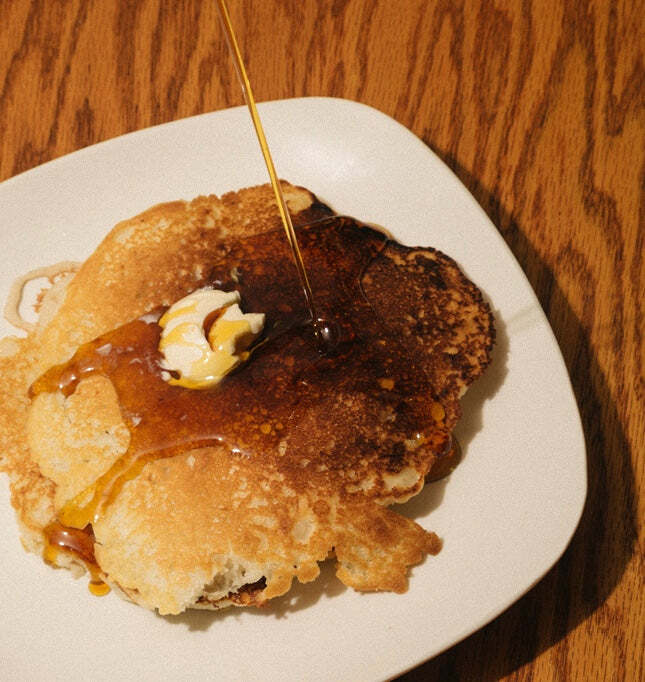 "I love the fluffiness and butteriness of the pancakes. They remind me of a stack of pancakes that you’d get from IHOP." Prep the caramelized bananas. Using a medium saucepan, melt the vegan butter and brown sugar on medium heat. Cook for about 4 minutes, until the sugar dissolves. Stir in the vanilla extract and coconut milk into the sugar and butter mixture. Add the sliced bananas, covering the surface of the sauce evenly. Cover the saucepan with a lid, and cook on medium to low for ten minutes. Remove the lid, flip the banana slices over, and cook for seven more minutes. Remove from heat, or keep on very low until ready to serve. Using a large mixing bowl, whisk the coconut milk, water, and vinegar together until foamy. Set aside for a few minutes to allow the mixture to curdle. Meanwhile, heat a skillet over medium heat. Add the applesauce, melted butter, and sugar into the milk and vinegar mixture and stir until combined. Add the cake flour, baking powder, and salt to the wet ingredients. Using a rubber spatula, mix until just combined. Allow the batter to rest. While the skillet continues to heat, coat it with vegan butter or nonstick spray. Once the skillet is hot, use a ¼ cup measuring cup or a ladle to scoop the batter onto the pan. Cook until bubbles appear in the center of the pancake. Flip the pancake over using a spatula and cook for thirty more seconds. Top the pancakes with caramelized bananas and serve immediately.